Old Hickory outdoor furniture is a perfect addition to your outdoor living space. With proper care and maintenance your Old Hickory outdoor furniture can be enjoyed for generations. Old Hickory applies multiple coats of DuraFinish to ensure long lasting protection to the furniture. Your Old Hickory outdoor furniture will weather, when exposed to the elements, which is normal and should not affect the integrity of the furniture. Old Hickory's DuraFinish is available in aerosol cans, for the occasional touch up if needed. When your Old Hickory outdoor furniture is not in use, we strongly recommend that you either cover it or bring it in, to ensure maximum lifespan, and minimal wear. 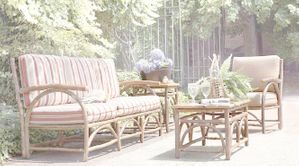 Our outdoor furniture has many cane and weave options, in addition to outdoor grade fabrics and cushions. Old Hickory Furniture is 100% Made in the USA!